The Studentenwerk Göttingen was MSC-certified in January 2008 and has since offered some MSC products in its canteens. More information about the Marine Stewardship Council (MSC) can be found here. The MSC is an independent non-profit organisation that has set a global environmental standard for evaluating fisheries. By using the MSC label, which points to the environmentally sound fishing practices of certified fisheries, it wants consumers to opt for products from certified sources when buying fish and seafood. The Marine Stewardship Council (MSC) allows people dependent on the fishing industry to promote sustainable fishing. By using the MSC label, sustainably managed operations can show their customers that they have committed to best practices. In addition, the MSC promotes improvements in fisheries management and provides independent evidence of the traceability of sustainable products. The basic mission of the MSC is to reverse the decline in global fish stocks, to protect the marine environment and to demonstrate the business value of responsibly managed fisheries. What is the MSC standard? The MSC standard complies with the International Guidelines for the Labelling of Fish and Fishery Products from the Marine Fisheries issued by the Food and Agriculture Organisation of the United Nations (FAO). That is, it is based on sound procedures and the principles of transparency, accountability and independence. ECARF is the abbreviation for European Centre for Allergy Research Foundation. The Foundation, founded in 2003, has set itself the goal of improving the quality of life of allergy sufferers and actively promotes allergy research. 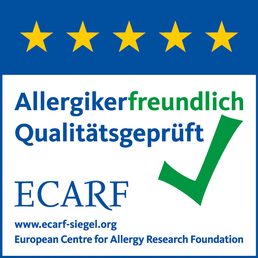 Since 2006, the ECARF quality seal has been awarded for allergy-friendly products and services. These excellent products and services offer a special added value for guests suffering from allergies and/or intolerances. The canteens and cafeterias of the Studentenwerk Göttingen have been certified by the ECARF as allergy-friendly catering facilities. Thanks to great transparency and care in the preparation of the food, we offer a special service for guests with allergies and/or intolerances, to make the selection of dishes more enjoyable and pleasant. The designation of 14 allergens, which are most often triggers of allergic reactions and intolerances, has been required by law since 13/12/2014. Therefore, Studentenwerk Göttingen honours the 14 declarable allergens in all canteens and cafeterias. For frequently asked questions around the topic allergens, we have compiled some information for you here. The labelling requirement is regulated by Regulation (EU) No 1169/2011 (LMIV = Food Information Regulation). It is valid since 13 December 2014. According to this regulation, consumers consider information on allergens in bulk to be very important as it has been found that most cases of food allergies are caused by loose goods. In some cases, food allergic people may develop life-threatening reactions even after consuming the least amounts of the incompatible food. When eating non-home-cooked foods, the risk and anxiety of developing an unintentional allergic reaction is great. In order to increase the quality of life of food allergy sufferers in this regard, the obligation to declare was also extended to lose foods and drinks. How exactly does the Studentenwerk Göttingen inform its guests? Are also possible traces of allergens in food labelled? According to the current Regulation (EU) No. 1169/2011 (LMIV = Food Information Regulation), the 14 allergens to be declared are to be mentioned only if they are added to a food according to the recipe. Declaration of traces, so unintentional contaminations of a food with the declarable allergens, are not legally required. Unfortunately, since cross-contamination in large kitchens can never be completely ruled out, traces are not identified by the Studentenwerk Göttingen. Are there any allergen-free dishes in the facilities? The Studentenwerk Göttingen does not offer a menu line that does not contain any of the 14 allergens that require declaration. Foods containing these 14 declarable allergens are high quality nutritional ingredients unless you are an allergic. We do not want to do without it in our meals. Due to our wide range and the free choice of components, there is the possibility to avoid the "personal" allergen and still to eat balanced and varied in the Studentenwerk Göttingen. How does the Studentenwerk Göttingen ensure that all 14 declarable allergens are properly declared? All products that reach the CampusGastronomie via purchasing and receiving goods must already be declared by the manufacturer. This declaration is transferred to internal documentation systems and enables a correct declaration of the food recipes. These formulas must be strictly adhered to during food production. Furthermore, all kitchen personnel are trained to comply with personal hygiene and regular hygiene standards that must be met before, during and after each step. However, unfortunately, we can never completely rule out unconscious cross contamination by declarable allergens in all these measures. Which processes in the facilities are important for a correct declaration? Already the employees who process the product purchase ensure that the purchased products are labelled with the 14 declarable allergens. If the recipes are changed, these employees will be informed immediately by the manufacturers or suppliers. Because this product declaration is the basis of the declaration of all existing food recipes. Both warehouse staff and kitchen personnel are instructed to ensure proper allergen labelling by covering, storing, and preparing food, and adhering to recipes and hygiene regulations. To uncover sources of error and to ensure compliance, all processes are checked regularly.